Sometimes I think, "Wouldn't it be nice to use a Mac instead?" posted by Jonathan at 5/10/2007 04:14:00 p.m. Ask Alexei for one, and become enlightened once more Jon - you know you want to! By Anonymous, at 5/10/2007 10:52 p.m.
By Adam Kalsey, at 5/10/2007 10:56 p.m.
Paul - You're right of course. 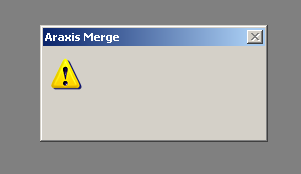 But I need my Araxis Merge and SnagIt! Adam - hilarious! At least you had a button! By Jonathan, at 5/10/2007 11:50 p.m.
Hi Jon. Macs aren't any better. We have an OS X production machine at work and it crashes just as much as Windows XP. Macs have the reputation of being stable because most users only run 1 program at a time. If you did what with Windows, it would never crash either. Macs are a real problem with getting Postscript drivers to work. Also, trying sharing on the network a folder on another hard drive. It can't be done. I found a program which forces a work around on the Mac. I'll bet the bad dialog box you got was the result of a missing font or the image flowing out of the dialog box. By Johan, at 5/12/2007 5:37 a.m.
By Jonathan, at 5/12/2007 11:02 p.m.
By Johan, at 5/13/2007 3:54 p.m.
By Jonathan, at 5/13/2007 10:06 p.m. I highly recommend Ubuntu-- being able to shape the OS to fit my needs is really rewarding! By Daniel, at 5/14/2007 7:26 p.m.
Daniel - Neat way to put it! By Jonathan, at 5/15/2007 6:01 p.m.
By goblinbox, at 6/06/2007 3:24 p.m.
goblinbox - yeah, when this dialog box happens you know it's going to be one of those days. By Jonathan, at 6/06/2007 9:01 p.m. I find it odd how rarely I see Araxis Merge mentioned. My favorite diff tool ever...and I try a lot of tools :). By David Pickett, at 7/12/2007 6:48 p.m.
No doubt, David - it's the Cadillac of diff tools. By Jonathan, at 7/12/2007 7:14 p.m.